What has been the worst display of wounded egotism, dressed up as a difference over arms control policy? On my scorecard, it’s a tie between Teller vs. Oppenheimer and Nitze vs. Warnke. J. Robert Oppenheimer always had qualms about nuclear weapons. His moral reservations grew appreciably when the Truman administration was contemplating a crash program to produce the “Super” – hydrogen weapons that could make the bombs that destroyed Hiroshima and Nagasaki look puny by comparison. 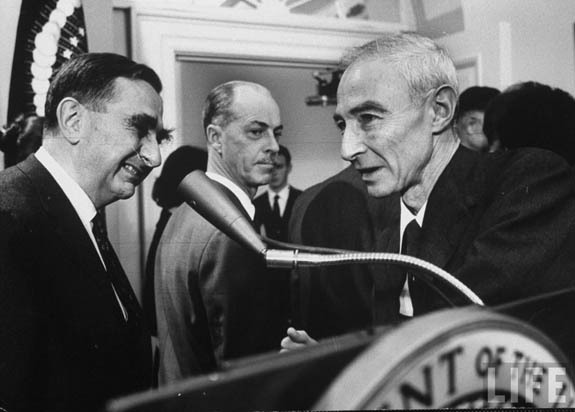 Oppenheimer’s opinions mattered greatly, not just within the counsels of government, but also with the public at large. Edward Teller resented Oppenheimer’s influence, especially on the Super, which he was drawn to even as those around him during the Manhattan Project were focused on more immediate objectives. Oppenheimer, still intent to maintain his influence as a government consultant, proposed boosted fission weapons and a wider panoply of A-bombs as an alternative to the Super. (An eerily similar debate along these lines is now evolving in India.) But his use of the “G” word was fatal, since this critique could apply, by extension, to the entire enterprise of nuclear deterrence. Teller and others lay in wait for the opportunity to cripple Oppenheimer’s influence. That opportunity came when Lewis Strauss, the Chairman of the Atomic Energy Commission, who thought Oppenheimer to be “dangerous” and his proposals “fatal,” suspended Oppenheimer’s security clearance right before it was due to expire on the grounds that he was a security risk, thereby prompting the accused to fight to clear his name. When Oppenheimer appealed this ruling, a star chamber proceeding was arranged to consider the matter, at which Teller testified. Paul Warnke’s ordeal, in contrast, was in plain view. President Carter nominated him to become the U.S. SALT negotiator and the head of the Arms Control and Disarmament Agency. Warnke’s heretical views (see “Apes on a Treadmill” in the Spring 1975 issue of Foreign Policy) made him anathema to the negotiating-from-strength school and its headmaster, Paul Nitze. Warnke’s confirmation hearings became the vehicle to impair his effectiveness and narrow the Carter administration’s negotiating options. These objectives were implicitly achieved by holding Warnke’s confirmation vote below the 67 needed for treaty ratification. Dr. Oppenheimer… has acted in a way that is for me exceedingly hard to understand. I thoroughly disagreed with him in numerous issues and his actions frankly appeared to me confused and complicated. To this extent I feel that I would like to see the vital interests of this country in hands which I understand better and therefore trust more… If it is a question of wisdom and judgment as demonstrated by actions since 1945, then I would say one would be wiser not to grant clearance. The head of the Arms Control Agency, I think, is a very important position… The President does rely, and should rely, and I think this Senate is expected to take seriously, the recommendations and positions as the head of ACDA. Therefore, I would have thought that it made a difference as to whether the thoughts of the person who was in that job are reasonably understandable to the Senate and to the public at large. Oppenheimer and Warnke were damaged goods after running these gauntlets, while their accusers got what they wanted. Teller went on to become the “father” of the H-bomb and to establish a new weapons lab in Livermore, California. Nitze helped block SALT II and was then rewarded with the negotiating assignments for which he felt he felt ideally suited. This stupid debate about “better American” still transpires. The better American it appears is always the one who is willing to be the more paranoid hawk. The true American spirit was anti-military. If it was pro-defense, it was most certainly isolationist and anti-offense. e.g. I think I am a better and truer American than (just to pick a random example) the freaks in Senator Kyl’s office in hewing more closely to the thinking of our founding fathers. Senator Kyl and his paranoid cronies are anti-American, in the truest sense of the word. The Democrats, typically, are better Americans than the Republicans. You start out claiming the debate is “stupid,” then go on to boldly claim “Democrats … are better Americans than Republicans.” You are sending a bit of a mixed message here, I believe. And your evidence is suspect. How was trying to maintain nuclear parity (or superiority) with the Soviets not “pro-defense?” Once more than one side of a conflict gets them, nuclear weapons are not a great offensive weapon; they are excellent for deterrance and defense. Any sort of nuclear offense would be met with a nuclear retaliation. This is why Teller and Nitze questioned the judgement of Oppenheimer and Warnke, respectively. And how was/is this purely a partisan issue? Also, Madison lived long before the rise of large national armies, the Industrial Revolution, and other events which drove “military revolutions.” The large voluntary citizen military of today is much less a danger than other government programs from which will “proceed debts and taxes.” I agree that small government is good government, but how have the Democrats been better than Republicans in this respect? Teller’s victory was not so unambiguous. For years he was persona non grata in Los Alamos and, at physics departments all over the country, people would refuse to shake his hand or attend his talks. He wounded Oppenheimer, yes, but also himself. Yes, TST, I think every democrat is a better American than every republican. Yes, the debate is stupid. And guess who, typically, initiates it? Republicans like Limbaugh, Palin, Cheney and the Fox News crew. True, we cannot hew to Madison’s exact advice to have no standing military. But the true American spirit shines through in his statement: a small military and small taxes and no adventurism abroad. Why do I say Republicans are worse Americans, typically, than democrats? Because they have strayed further from the vision of America that our founding fathers had, as of late. They have got us into very expensive needless — and apparently endless — wars abroad. We have to pay for those wars and the war machinery behind them. I am sick of their tax and spend (on war) attitude. The single biggest chunk of our taxes goes to the military — and the funding of the military debt. Military force — even when wielded by the seemingly strong against the nominally weak — continues to be an exceedingly uncertain instrument. The Republicans’ penchant for projecting power has created many more problems than it has solved. Genuinely decisive outcomes remain rare, costs often far exceed expectations, and unintended and unwelcome consequences are legion. The pursuit of US military dominance by the Republicans, and the neocon fools, is an illusion, the principal effect of which is to distort strategic judgment by persuading policymakers that they have at hand the means to make short work of history’s complexities. The real need is to wean the Republican Party from its infatuation with military power so that they come to a more modest appreciation of what force can and cannot do. Throwing more money at the Pentagon is not a solution to what ails America. What have Republican policies done since 9/11? Rather than diminishing, the threat from al Qaeda and its affiliates has grown, engulfing new regions of Africa, Asia, and Europe and creating fear among peoples from Australia to Zanzibar. The US invasions of two Muslim countries so far failed to contain either the original organization or the threat that now comes from its copycats in British or French cities who have been mobilized through the Internet. The al Qaeda leader is still at large, despite the largest manhunt in history. Afghanistan is once again staring down the abyss of state collapse, despite billions of dollars in aid, a hundred thousand Western troops, and the deaths of thousands of people. The Taliban have made a dramatic comeback. The Republicans had an extended window of opportunity for several years to help the Afghan people—they failed to take advantage of it. In 2009, American power lies shattered, and US credibility lies in ruins. Ultimately the strategies of the Republican administration have created a far bigger crisis in South and Central Asia than existed before 9/11. That’s why I say Democrats are better Americans, typically, than Republicans. It’s not fun to be called anti-American is it? If you don’t like the stupid debate, tell your Republican friends to stop initiating it. PS: I met Teller — he was an irrational fear-mongerer, an attitude probably born of his personal history.